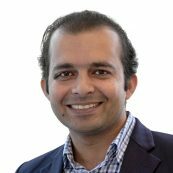 Asim Nasar is an Atlas Corps Fellow for the Strategic Initiatives Department where he provides research, design, and strategy support. Asim holds a Master Degree in Business Administration and currently pursuing a Ph.D. degree from Universiti Teknologi Malaysia. He has nine years of experience in research, big data analytics, program design, monitoring and evaluation of diverse community development projects that focus on women entrepreneurship, and health interventions. He has conducted ethnographic evaluations and quasi-experimental research studies to scale-up the social franchise model in Pakistan.